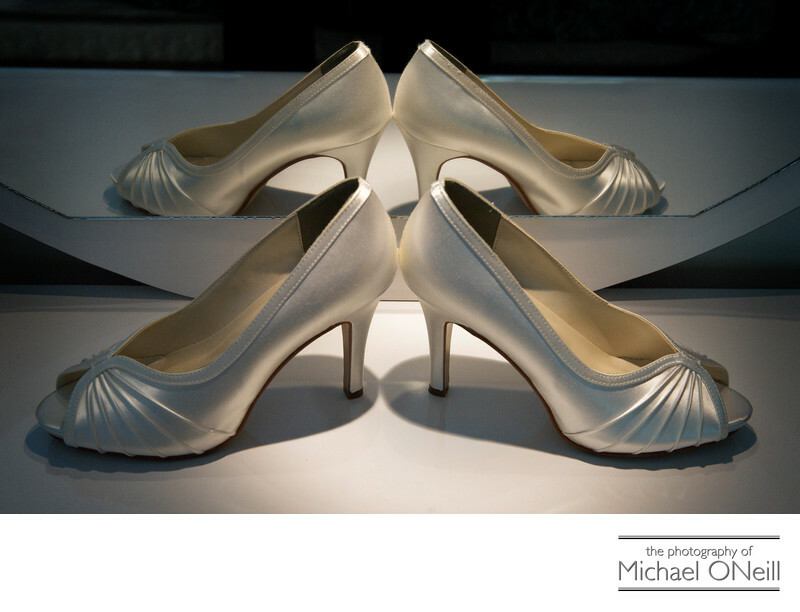 Another cool picture of a bride’s shoes. When my bride and her bride’s maids are getting ready for the big day ahead I am there to document the activities. The finishing touches on hair styles and make up artistry, presentation of gifts to the bridal attendants, the bride’s wedding dress hanging up, waiting for the bride to step into it on her wedding day. Lots of emotions are being felt in these final moments and lots of little details are lying about waiting to be documented. The wedding invitation, wedding rings, the bride’s bouquet (as well as those of her bridesmaids), jewelry; gifts, cards and flowers delivered from her groom...and, of course, the bride’s shoes. Every bride spends a lot of thought, time and money picking out the perfect shoes to compliment her wedding gown and every bride wants a creative picture of her shoes for her finished wedding album. I try to do something different photographically...creatively...at every wedding when taking pictures of the bride’s shoes. Check out the rest of the images here on this web site and you’ll see lots of variety when it comes to taking this important wedding photo.